Founded in 1959 by Frank Flaman, this is where the Flaman Group of Companies got its start. We sell a full line of trailers, such as stock and horse trailers, steel, and aluminum flat decks, car haulers, cargo trailers, tilt trailers, utility trailers, AirTow Level Load trailers, Ag transport trailers (both sprayer and combine), dump trailers, trailers for recreation, snowmobile trailers, and much more. We feature brand names such as Trailtech, Aluma, Wells Cargo, Diamond C and Southland Trailers. Southey is the home of one of our two Grain Cleaning locations across the province, with the other being in Saskatoon. Here, we sell and service grain cleaners, color sorters, and Kwik Kleens. Besides our Grain Cleaning division being stationed here, we also deal in rentals, and in the sales of farm hardware and agricultural equipment. 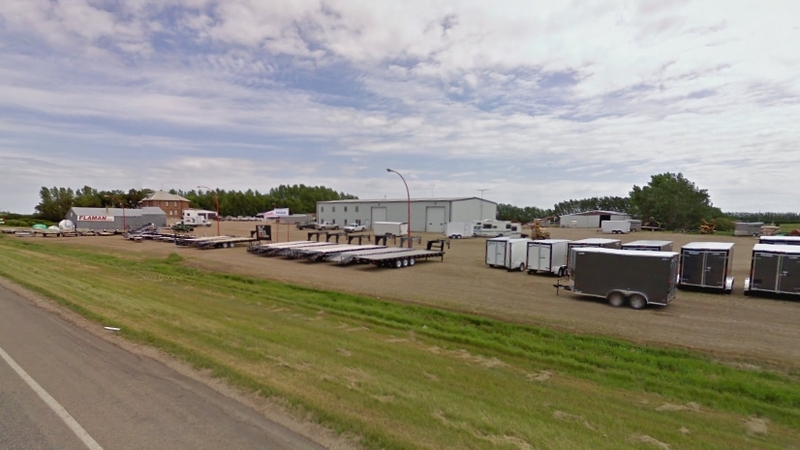 Just like each other store, we rent a wide variety of trailers, including flat deck and enclosed trailers, with sizes ranging from 10' to 24', as well as other agricultural equipment such as grain vacs, discs, bale carriers, post pounders and heavy duty mowers. For farm hardware, we are heavily invested in helping you get set up with what you need to get your product on/off the ground as quickly and efficiently as possible with a diverse variety of chemical handlers, water and fertilizer tanks, wire rollers, and a huge selection of pumps and attachments for your seeders. Looking over our agricultural division, it is difficult to touch on everything that we sell. We sell many different types and sizes of grain and fertilizer bins, whether they are hopper bottom or flat bottom with aeration. We sell aeration fans, temperature monitoring cables, and grain probes for you to keep tabs on your grain and to keep it in the best shape for sale. Over to field implements, we carry heavy breaking discs, augers and conveyors, grain baggers and extractors, as well as grain vacs for the sticky situations you may find yourself in. We have a large selection of three point hitch in stock, with mowers of various sizes, tillers, scrapers, blades, harrows and snow blowers. We are located one mile north of Southey on Highway 6. The coffee's always on, so stop in for a visit!